Hearthstone's upcoming Grand Tournament expansion is just on the horizon and Shacknews is continuing to check out the new cards that are set to debut. Today, we analyze another handful of cards, including some potent new legendaries for the Warrior and the Mage. Shacknews is working each day to stay on top of the newest Hearthstone Grand Tournament expansion cards being revealed by Blizzard. The pace is starting to slow down after a brief explosion, but nevertheless, we continue to stay on top of each of the new card reveals. Let's continue. 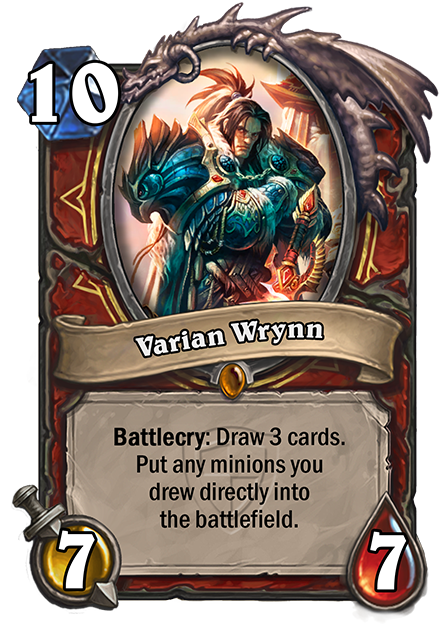 Now we're starting to see minions that will play nicely with some of the newer Grand Tournament reveals. Garrison Commander will be particularly useful with Justicar Trueheart, which will give all the classes a chance to wreak their own kind of havoc. (Alright, maybe not the Rogue, so much, but it's the thought that counts.) Of course, Hero Powers will cost the same, so players may want to consider slicing that cost down by playing Garrison Commander alongside Maiden of the Lake. 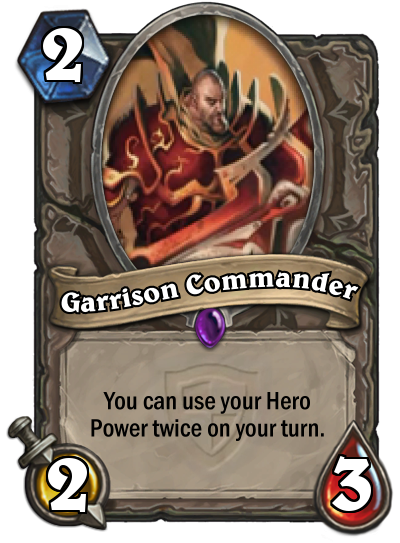 The problem with Garrison Commander is that his effect is not a Battlecry, so when he goes, so too does his effect. Don't expect him to last long, either, with lowly 2/3 stats. Since the Hero Power mana cost is not changed by his effect, playing him as a Turn 2 is not practical. If you can ensure his protection, he'd be a strong late-game play, whether it's for the Warrior to armor himself back up or for the Paladin to start filling up on Silver Hand Recruits. Again, this is a fine strategy after playing Justicar. Otherwise, be careful with how you play this minion. This appears to be a lower-cost Spellbreaker, but there's a notable problem with this guy. His effect will only work on Demon-type minions, as in ones mainly used by the Warlock. 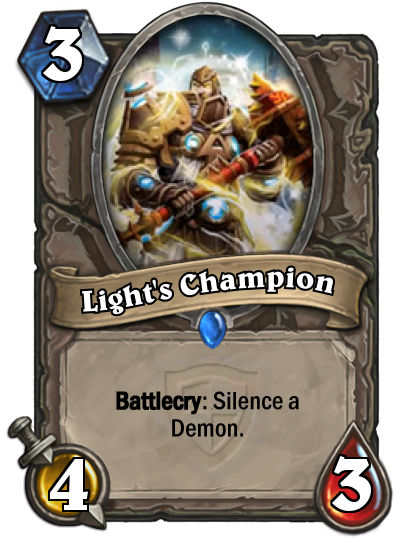 So what good does Light's Champion do against all other classes? The answer is, not a whole lot. Light's Champion looks to be a situational use only, but perhaps the Warlock can get some decent use out of him. Some Demons have noteworthy drawbacks, particularly the newly-revealed Wrathguard. Turn 2 Wrathguard, followed by Turn 3 Light's Champion opens the door to some early-turn chaos, but this sounds a little too circumstantial to really be effective. Even with the lower mana cost, stick with Spellbreaker for your Silence needs. 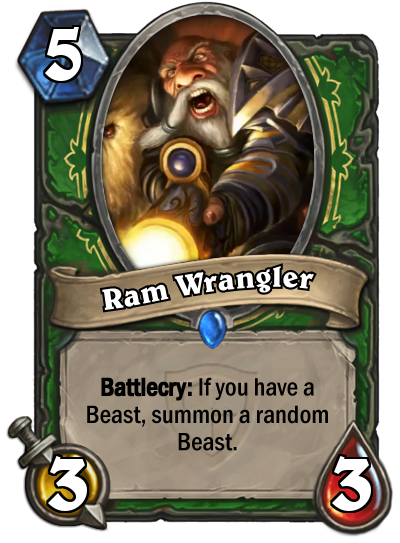 With so many beast minions inhabiting Hunter decks, this would appear to be a solid play for Midrange Hunters. In most instances, it'll be a free beast, which is always welcome. Just don't always expect it to be particularly valuable. Keep in mind that most beasts are either low-value minions (Bloodfen Raptor and River Crocolisk come to mind) or high-value minions that are easily removable (Hello, Core Hound!). That's not to say there won't be positives. There will always be the freak instance where this calls down a King Krush or Gahz'rilla. Just don't be disappointed if you end up with Captain's Parrot. With all that said, always have a Houndmaster ready to beef up whatever does come out. Even the lowliest of minions will benefit from a +2/+2 Taunt boost. Here's a fantastic Warrior legendary for decks that would rather skimp on Grim Patrons. That effect is just too good to pass up. The card draw is good in itself, but the fact that minions are immediately played sounds really tempting. The potential for immense damage is great. Drawing Kel'Thuzad means all minions already on the board can sacrifice themselves with no fear. Drawing Ragnaros will still see his effect kick in at the end of the turn. And drawing Grommash Hellscream will still put him on the board with his Charge ability. Of course, since you'll more than likely have no usable mana left, better give him a little boost with Inner Rage first. There are possibilities for late game chaos here, so opponents will want to work really hard to put those Control Warriors away early. If not, Turn 10 could be a real nightmare. Here's a new Mage legendary that's comes with a very versatile effect. Deathrattle means that yields three Arcane Missiles spells. As a 7/7 minion, Rhonin proves decent on his own, but Mages will be packing him in for that effect. The main minion that will benefit from this effect is Archmage Antonidas, who can put those 1-mana Arcane Missiles to work and subsequently turn them into three Fireball spells. The Arcane Missiles may fly around randomly and won't always hit their targets, but those Fireballs will be pretty sweet. For a more immediate impact, try this play alongside Sorcerer's Apprentice. There's another big-time legendary that will get a major benefit from this effect and that's Malygos. If the aforementioned Sorcerer's Apprentice is already on the board, the Arcane Missiles can all be played right alongside Malygos, with those spells shooting out 8 random missiles a piece. That's a total of 24 missiles firing all over the place, which could be a game-changer, depending on the situation. There's also a third legendary that would like to take advantage of this effect, one that marches to the beat of a different drum. 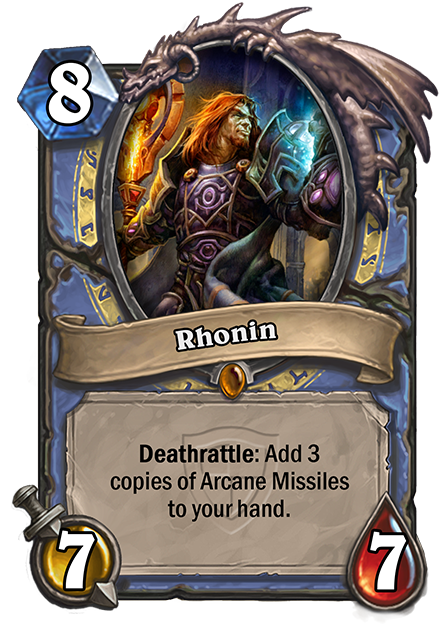 Mech Mages will want to play Rhonin in their decks and use those Arcane Missiles with Gazlowe to bolster their Mech ranks. This could be a life-saver in the late stages of a game and a strategy that could outlast a good number of opponents.